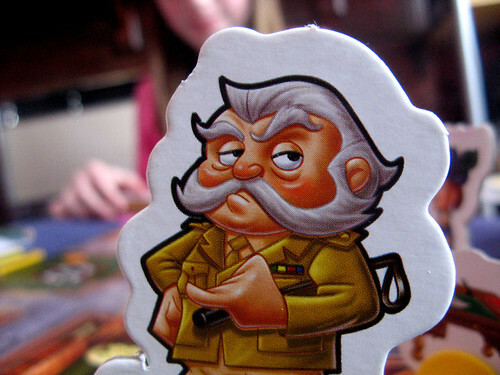 Will the lunar mission be led by Col. Mustard, too? I don’t have a clue. “In line with its plan, IP-PRIME has contracted IPTV signal delivery agreements with 70 small telecom operators, of which 37 have so far reached commercial stage. However, with a subscriber base of less than ten thousand at the end of November and after more than 2 years of service, the consumer uptake is insufficient to justify continuing operations,” said Rob Bednarek, President and CEO of SES AMERICOM-NEW SKIES. The IP-PRIME service will continue to operate until July 31, 2009. This will offer telecom operators an opportunity to orderly transfer their services and SES AMERICOM, in collaboration with third parties involved in the service, to seek the best option to transition the business. Sure, it was costing lots in resources (people and money) to keep the C-band based service running. It was ahead of all competitors in the U.S., but it was tough to convince SES management it was worth the continuing effort. Inside Americom, people thought the way out of this was to sell the service and related assets to EchoStar, who had their own Ku-band based service, ViP-TV. Ironically, using the AMC-16 satellite they were leasing. EchoStar Satellite Services, a division of EchoStar Corporation (NASDAQ: SATS), announced today the company’s IP-Prime Conversion Program, designed to provide continued delivery of video transport services for telco IP headend facilities across the United States. Commercial transport provider IP-Prime has previously announced it will discontinue its video transport service to headend facilities by July 31, 2009. EchoStar’s IP-Prime Conversion Program provides qualified customers with EchoStar’s ViP-TV(TM) transport service, replacement IDC satellite receivers and a standard professional installation, including compatible LNBs, a satellite dish re-point, cabling and connectors. Interesting development, but not unforeseen. With IPTV subscibers doubling to 3.8 million in North America, EchoStar’s timing is typically very good. Not surprisingly, Western Europe is still the leading IPTV region in the world, but regions such as North America continue to show their own strong growth paces. That’s the word from research firm Point-Topic and the Broadband Forum, who announced their fourth-quarter 2008 numbers at the IPTV World Forum in London this week. Western Europe had more than 10.3 million IPTV subscribers at the end of 2008. North America, despite the U.S. being Ground Zero for the recession, saw its IPTV subscriber numbers grow a whopping 113 percent to more than 3.8 million from the end of 2007 to the end of 2008. Worldwide, IPTV subscribers totaled 21.7 million at the end of 2008, representing growth of 63 percent from the previous year. 19th crew to man International Space Station takes off from Baikonur Cosmodrome, beginning new era at International Space Station. Walton Di-Icing intoduces a product that will shake your VSAT antenna cover to get rid of snow and moisture accumulation. Neratel selects Gilat SkyEdge bro[adband satellite network with full mesh capability to serve a government agency in Southeast Asia. Intelsat announces that South Korean teleports will access Intelsat for KT Corporation to host two new GXS Network Broadband hubs. KVH launches $1000 free airtime promotion to get boaters to try their Mini VSAT product. North Korea’s stated intent to launch a satellite continues to raise concern in U.S. and Asian countries because the same Taepodong 2 rocket technology could be used to lauch intercontinental ballistic missiles which could reach the United States. RRSAT launches an additional video platform on Intelat’s Galaxy 19. Satellite 2009 added 60 new exhibitors; many introduced new technology innovations in their latest products. Hughes announces next generation HX satellite router. Hyundai Heavy Industries’ Construction Equipment Division has selected ORBCOMM’s [Nasdaq: ORBC] satellite network to provide global communications for Hi-Mate, its telematics application for heavy equipment. China scores major win with contract award from Eutelsat for satellite launch. We’ve blogged about the "cantenna" and repurposing old parabolic dishes for boosting WiFi signals. With people switching from direct-broadcast satellite TV (DISH and DirecTV) to Verizon FiOS, AT&T Uverse, back to cable TV or just cutting all pay television services and using free over-the-air HDTV, you might want to consider using your old antenna for something else. Birdbaths and Spartan shields are OK ideas, but using it to boost cell phone or WiFi signals might be more useful. We’ve got a place up in the mountains and finding a good cell signal can be tricky. While working in my yard one afternoon I noticed an old satellite TV dish on top of a pole in my backyard. It had been left there by the previous residents. Suddenly a light bulb came on. I grabbed some wrenches, took down the dish and held my cell phone next to the antenna’s horn. I was amazed to find that I instantly got full signal. I could not believe my eyes. I went from no signal to full signal and had not spent a dime or changed anything on my cell phone. Just to make sure I made a call using speaker phone and found that this thing truly did work. The next test came when I took the assembly inside the house to try it. With aluminum siding on the house I have problems even getting a television signal using a rabbit ear antenna. To my surprise, I got two bars inside so long as I pointed the dish at a double window in my living room. I no longer miss calls and I don’t have to leave home to talk on my cell phone. It isn’t an ideal setup but it works and did not cost me anything. 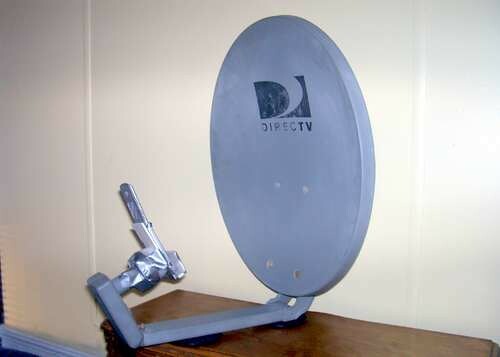 It is also a great way to recycle that old dish antenna that would have ended up in the trash otherwise. 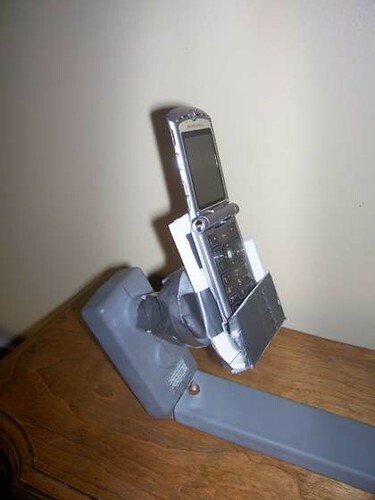 I will try this myself, as I have the two main elements: weak cell signal and an old antenna. Building online communities does not happen overnight. I started building one in October of 2002 for my fraternal group in Ukrainian Scouting. We used YahooGroups to help facilitate communication and information sharing. Pretty active little group, but closed to the public. In mid-2005, while employed at SES AMERICOM in Princeton, our new CEO’s plan included starting a blog. I didn’t think we needed it, but with help from Mike Ford, I soon came around and became the chief blogger and promoter. I also had responsibilty for keeping our external Web sites current (SES AMERICOM, AGS, REDiSat Network, IP-PRIME, ABN and HD-PRIME), so I was the natural choice. What a great experience it was working with the team at EchoDitto, Joe Trippi and Matt Gross. Here I am, still editing this blog but no longer employed by Americom. Since we went live in early March of 2006, this blog has logged more than 196,000 visits and 322,000 page views. Not bad for a B2B blog in the satcom business (so they tell me). Besides ILS (who I advised), nobody in our community has built a real blog. Now Intelsat seems to be coming around with their blog, introduced this week. So far, the posts have been strictly business and one way in nature. Hope they stay active and find their voice online. And let’s see how long it takes for my comment to be published — if ever. Blogging is good for you. Go on. Following an urgent call from the Pentagon’s Joint staff on February 6, Intelsat responded with a solution to reposition one of its domestic U.S. satellites, Galaxy 26, to a new orbital location in the Indian Ocean region. Intelsat began moving Galaxy 26 from its orbital slot at 93 W to its new position on February 20, once the existing commercial traffic assigned to the spacecraft had been shifted to another Intelsat satellite, Galaxy 25. Intelsat was able to begin drifting the Galaxy 26 satellite into its new orbital position only two weeks after the Department of Defense (DoD) request, a demonstration of how quickly the commercial industry can respond to solving critical warfighter requirements. The contract, awarded through Artel Inc. as part of a DoD contract known as the DSTS-G (Defense Information Systems Network Satellite Transmission Services – Global), will fill a military bandwidth void supporting UAV surveillance operations. The repositioned Intelsat satellite will support launch and flight operations of Unmanned Aerial Vehicles (UAVs) deployed in the war zones, as well as other U.S. and NATO military operations in an area reaching from Germany to Southeast Asia. "One of the key advantages of the Intelsat fleet is its scale and flexibility," said Kay Sears, President of Intelsat General. "This is the third time we have been able to reposition one of our satellites into a new orbital location to support critical operations on the ground in these two vital regions. Moving this satellite to the Indian Ocean region will prevent the disruption of a range of important military activities in that area." The contract calls for up to 432 MHz of bandwidth using 12 Ku-band transponders operating on the Galaxy 26 satellite, which had most recently been serving North America. The satellite, using wide-beam capability, can support up to 40 UAV sorties simultaneously. "This move is of particular importance, since we did not want any service interruptions to the DoD missions and there was no other capacity available to fulfill these requirements without this bold move by Intelsat," said Abbas Yazdani, President and CEO of ARTEL. 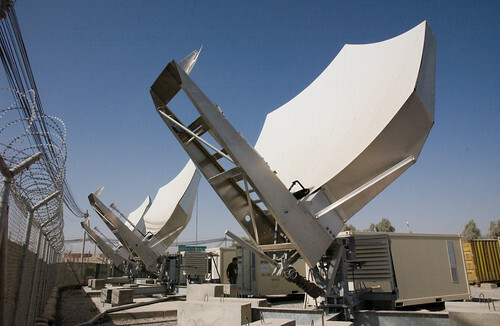 The demands for bandwidth created by the conflicts in Iraq and Afghanistan previously prompted Intelsat to twice move satellites in support of Intelsat General’s military customers. Anything to keep the customer happy, but it helps to have a spare communications satellite to work with. Access Intelligence still has a pretty good game going, with hundreds paying money to attend their show in Washington. It opens today. A1 Microwave Ltd (Booth #157) announces the A1 Microwave PB1109WN, a satcoms receive filter used to reject the transmitter signal in X-band satcom terminals. This tunerless, mechanically robust design occupies only 157 mm of waveguide length and it provides 90 dB rejection over the transmitter band 7.9-8.4GHz. Insertion loss in the receive band 7.25-7.75 GHz is only 0.5 dB. It is ideal for use in small or portable systems where size is at a premium. Actox Corporation (Booth #176) has just released several of the smallest and the lightest Block Up Converters in the industry for Ku-Band, C-Band and X-Band. The units feature auto-ranging power 18-70VDC, 80-240VAC; double L.O., advanced M&C interface as well as sophisticated LED indicators. A-Alpha Waveguide Company (Booth #720), announces they are now stocking aluminum waveguide flange stock in sizes from WR22 to WR137 and double ridged sizes WRD180, 475, 580, 650, and 750. This 6063 extruded aluminum material precludes the need to broche corners in the windows of aluminum bar stock to manufacture flanges. Ameripack Inc. (Booth #191) introduces the Road Warrior Transit Case Family. The Road Warriors are the best Air & Water Tight Transit Cases designed and manufactured in the U.S.A. that provide the most protection in any environment. Commtact-Mobile SAT (Booth #144) announced the new Mobile Satellite Terminal (MOST: undefined, undefined, undefined%). The system is designed for a high bandwidth two-way communication between moving platforms (aircraft, ground vehicles, etc.) and geo-stationary satellites in Ku/Ka bands. The MOST system has excellent cost-performance characteristics, utilizing a high efficiency shaped reflector Antenna, a state of the art low profile design, creating an ODU (Out-Door-Unit) of only 28cm height. Comtech Telecommunications Corp. (Booth #308) announces that its subsidiary Comtech Mobile Datacom Corporation recently filed patents for two key components of its next-generation Blue Force Tracking-High Capacity (BFT-HC) network. The first patent filing covers the Advanced Software Defined Radio (ASDR: undefined, undefined, undefined%) transceiver, or BFT-HC transceiver. The ASDR represents a significant leap forward in mobile transceiver technology and is designed to meet or exceed all performance requirements identified for the BFT program’s next-generation satellite-based communications network. The second patent filing covers next-generation earth station technology for the BFT-HC network referred to as Adaptive Multi-User Detection (AMD: 3.02, n.a., n.a.%). This next-generation AMD equipment employs advanced signal processing techniques hosted on state-of-the-art hardware, which allows near real-time processing of overlapping signals transmitted by numerous mobile terminals. Dow-Key Microwave Corporation (Booth #368) announces LAN eXtensions for Instrumentation (LXI: undefined, undefined, undefined%) certified switching systems. These LAN eXtensions for Instrumentation (LXI: undefined, undefined, undefined%) certified switching systems offer a broad range of functionality to meet a wide variety of applications needs in design verification, combining state-of-the-art measurements in a small package at a cost-effective price. EchoStar Satellite Services (Booth #597) announced an agreement with Vredes, Inc., to provide satellite services for emergency management and other remote location broadcast demands. 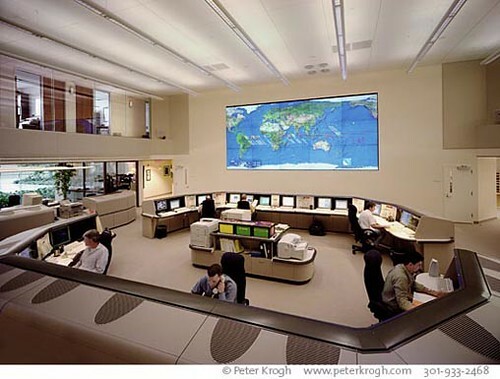 With access to EchoStar’s satellites and state-of-the-art digital broadcast centers, Vredes will provide fully redundant transponder and hub services to support MotoSAT and its EtherSAT(TM: 65.23, 0, 0%) Service, which offers government and enterprise customers redundant, on-demand broadband internet, voice and video services, especially during national disasters or when working in remote locations. EMS Technologies Defense and Space Systems (Booth #121 ) is introducing to the aero connectivity market Ku-band broadband antenna systems that support satellite direct TV programming, internet, email, VPN, VOIP, instant messages, video conferencing and various entertainment applications such as video-on-demand, live TV, online gaming and multimedia applications. The system offers true, full-featured broadband services aboard any size aircraft, from wide or narrow-body commercial aircraft to small VIP business jets. Global Satellite USA (Booth # 1608) has partnered with worldwide crisis response company Global Rescue to provide their clients with the highest level of medical and security information and emergency evacuations from around the globe. This partnership will allow Global Satellite’s clients to rely on effective communications solutions in an emergency and ensure that someone will be able to provide them with emergency services, including worldwide field rescue and evacuation from distant and isolated regions to the members’ hospital of choice or safe location. iDirect (Booth #517) has launched the iConnex e850mp Board that can be carried and deployed by a single soldier and support advanced military applications. The iConnex e850mp Board provides advanced portability and flexibility to support the rigorous demands of military and government satcom applications. The e850mp, easily carried and deployed by a single soldier, provides a highly capable solution for voice, video and data connectivity on the battlefield. Iridium Satellite LLC (Booth #437 ) is announcing several new products at SATELLITE 2009: the 9522B, a second-generation L-Band Transceiver (LBT: undefined, undefined, undefined%); the 9555, a new satellite phone; and OpenPort(TM: 65.23, 0, 0%), the world’s first and only global voice and data device engineered for the maritime market. The 9522B is designed to be embedded into a range of mobile satellite terminals, packaged with an external power supply, antenna and other components. The compact, lightweight LBT unit with built-in SIM card reader supports all Iridium-based services, including voice telephony, circuit-switched data, short-burst data (SBD: undefined, undefined, undefined%) and short message service (SMS: 13.22, 0, 0%). The 9522B is ideal for use in equipment on aircraft, ships and other transport vehicles and devices around the globe. A recent decision to build a new rocket launch site in Hainan island and securing a deal to launch Europe-based Eutelsat Communications’ 5-ton satellite have put the spotlight on China’s space ambitions. These developments testify to China’s success in pursuing space technology under its own steam following a U.S. policy in 1990 barring it from launching satellites with U.S. components. The impact has left China to seek customers from second-tier operators from Asia, Africa and South America. The Eutelsat order is the first satellite launch deal from a major western country in more than a decade for China marking a high point in its space exploration and satellite-building program. As a supplier of commercial satellite products and services to the United States, Eutelsat’s order with China is seen as controversial by industry observers and officials on both sides have been cagey about confirming the order. Made without any U.S. components, the Eutelsat satellite is scheduled for launch by China’s Long March rocket in 2010. Cost competitiveness is a good reason for China’s ability to secure the satellite launch order which could be as much as 40 percent less than the price of its western counterparts. The last launch of a western satellite on a Chinese rocket was in 1998 by ChinaStar for a Lockheed Martin-made satellite. During the House Committee on Science and Technology’s hearings on export reforms on Wednesday, California Congressman Dana Rohrabacher (R-CA) issued an attack on Eutelsat for its decision to launch its communications satellites on Chinese Long March rockets. This is something that is forbidden to American satellite owners under export laws. “Everyone agrees ITAR reform needs to happen. We need to make sure that our hi tech exports aren’t strangled by regulations. On the other hand, we need to remain vigilant that our advanced technology doesn’t end up in the hands of nations who proliferate weapons of mass destruction. We know exactly who these nations are, and we must make absolutely sure that whatever changes we enact to ITAR and other export regulations, that these scofflaw and rogue nations are barred from receiving our high tech systems. “Chief among them is the Peoples Republic of China. Ten years ago, the Cox Report clearly demonstrated that U.S. technology transfers to the Peoples Republic of China helped to improve and enhance the efficiency of China’s arsenal of missiles that were aimed at us. As a consequence, we passed the Strom Thurmond Act, which established the requirement that before any satellite technology could be exported to China, the President of the United States had to first certify to Congress that the tech transfer was not inimical to our national security or our domestic launch or satellite industries. Since the Strom Thurmond Act became law 10 years ago, not a single such certification has been made by any administration, and as a consequence no Western satellite payload has flown on a Chinese rocket. “But the resolve of the Obama Administration is now being tested in this area. Just as our Secretary of State, Hillary Clinton was visiting the Peoples Republic of China, European satellite operator Eutelsat was a cutting a deal with Beijing for a launch on a Long March rocket. Incidentally, Eutelsat sells tens of millions of dollars worth of satellite services to the U.S. Government through DISA contracts. Clearly, this is the beginning of a game of chicken between Eutelsat and the Obama administration. If the Obama administration does nothing, the message is clear—transferring technology to proliferators of weapons of mass destruction like the Peoples Republic of China is a perfectly acceptable business model. “Surely we can make sensible changes to ITAR and other export regulations, but we must not go so far as to make them at the expense of our national security. Let us reward our friends with openness in trade; and conversely let us be as single-minded as possible in stopping items from the United States Munitions List—like Eutelsat payloads– from falling into the hands of the Peoples Republic of China and other proliferators. International Launch Services and SES announce three new launch assignments under the Multi Launch Agreement that was signed in June, 2007, including NSS-14 for SES NEW SKIES and Sirius 5 for SES SIRIUS. In a fast-paced video, the presenter runs through a process that essentially combines chemicals from tea and American-style sugared doughnuts to form a solar energy soaking film that can be applied to a sheet of glass. The process isn’t easy and requires a fair amount of scientific kit, but he starts by extracting “titanium dioxide nanoparticles” from some powdered sugar doughnuts. Roughly ten layers of these nanoparticles applied to a sheet of glass is, according to the video’s presenter, “pretty much a solar cell”. But because this set-up on its own won’t work with “regular sunlight", the presenter next extracts organic dyes from a cup of sweet tea that enables the solar cell to “absorb light we can see”. Finally, to prove that his invention works, the solar scientist hooks the cell up to a multimeter that appears to show an electrical current being generated from the DIY solar cell.